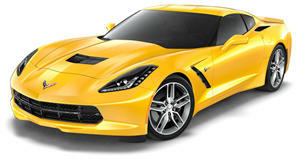 The C7 Chevrolet Corvette is a bona fide American super sports car – no ifs ands or buts about it. Available in 3 flavors, ranging from the mild Stingray to the spicy Z06, with a hot, but not too hot Grand Sport in the middle, there’s enough spice for anyone craving their all-American super sports car fix. New for 2018, Chevrolet has added new color schemes, new alloy wheels, and an enhanced heads-up display, but at its core, the Corvette range remains the same – and if it ain’t broke, don’t fix it. The Corvette seats two in its relatively tight cabin. Ingress and egress are a little tricky due to the low seat and roof height, but name a sports car that’s truly easy to slip in and out of. As for the interior packaging, it’s an incredibly appealing one – the design is fresh and attractive, and a range of varying colors and types of upholstery from leather to Alcantara ensure customization can be made to suit your style. The convertible opens your world ad gives you substantially more headroom, though even in coupe format you can remove a section of the roof and stow it in the trunk. With that said the roof panel does tend to rattle a little, and some of the build quality can at times feel a little less than perfect. In terms of infotainment, Chevrolet’s MyLink handles it all via touch screen, and the system includes Apple CarPlay and Android Auto. Optional magnetorheological dampers with selective ride control give the ‘Vette a duality to its ride; comfortable when cruising, or able to corner as flat as a racecar when at the track. On rough roads, though, and on 19-inch wheels, Chevrolet has worked black magic to get the ride as composed and absorbent as it is – rivaling and outdoing supercars at more than twice the price. The steering in the Corvette is syrupy smooth, with good weighting and a lovely natural loading under pressure. Front end grip is reliably brilliant, hanging on like a cat to your mother’s curtains. The electronic rear differential on the Grand Sport and Z06 models maximizes rear end grip and improves handling vastly compared to the standard Stingray, as do the Michelin Pilot Super Sport Cup 2 tyres from the Z07 package. Rear-wheel drive is all you get on all Corvette models – driven through either a 7-speed manual with rev-matching function, or an 8-speed automatic. Doing the driving is a 6.2-liter V8; in Stingray trim it kicks out 455 horsepower and 460lb-ft of torque, with both figures taking a 5-digit climb with the performance exhaust – standard on the Grand Sport. The Z06 bolts on a supercharger to generate power and torque in equal numbers – 650. With the Z07 Performance Pack and 8-speed auto, expect it to cream the 0-60mph dash in 2.95 gloriously short lived seconds. Stingray and Grand Sport models get 3 sub-trims – 1LT, 2LT, and 3LT – with the Z06 getting 1LZ, 2LZ, and 3LZ offering the same upgrades. Standard trims include smaller wheels, keyless entry, dual-zone climate, and power-front seats. 2LT/Z includes front camera, heated and ventilated seats, a Bose sound system, and a heads-up display on the LTs (Z06 gets it as standard). The 3LT/Z models get premium leather upholstery, synthetic suede trim, and the Corvette’s data-logging navigation system. The Z06 as standard gets extra carbon fiber bits, sportier suspension, wider tires, and larger brakes. As with most sports cars, no crash tests have been performed on the Corvette. It may have one or two minor flaws in its build quality, but they’re forgivable for everything else the Chevrolet Corvette offers. The Z06 can be a handful, so we recommend the Grand Sport with Z07 handling package as the best of all worlds.